Please be aware that the fight is very new and lots of these mechanics and explanations offered can be suboptimal and as more knowledge of fight is made known I will add/change the strategy. 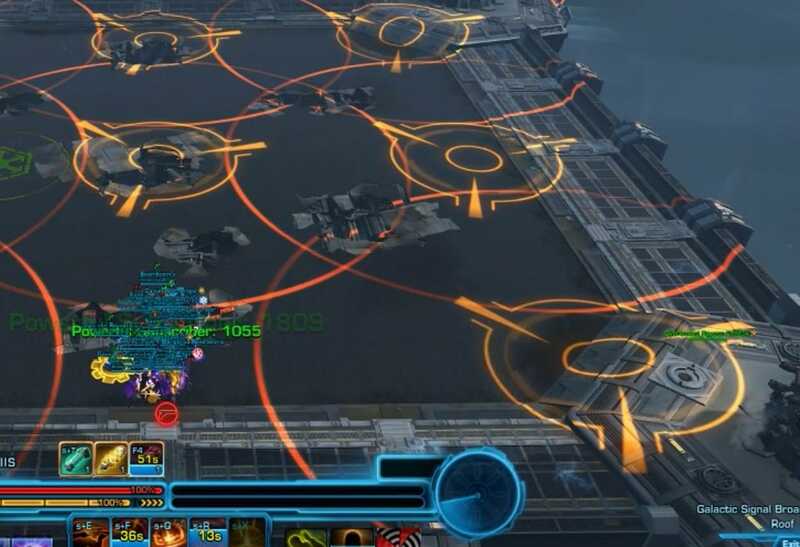 Huge thanks to the 15 Wookies that joined me in killing this yesterday evening, one of the first Izax kills on the server and BW Dev Matt Pucevich who was watching the stream and congratulated us upon killing it. The full video of the kill can be found here, thanks to Dready for making this available, you can find his twitch stream here where he streams hard mode Gods and Nightmare content. I would advise that people who have not seen the fight before taking a look at the video before, after or during you reading the guide below to make it easier to understand the mechanics. Things to note: Combat Revive has a 30-second cooldown on SM, abuse this to instantly revive anyone who dies during the boss fight, having everyone up helps a lot with pushing phases quicker. During the first phase, there are three mechanics to keep in mind, first the person in front of the boss gets stacks of Melee Vulnerability, on Story Mode the DPS requirements are really low to push it to the next phase and the damage is low, so one tank should be enough, no swapping needed. The second mechanic is Spiking Force, a raid-wide root which prevents you from moving, this is not relevant to care about on SM but for HM you need to break and run towards the side as the boss "slams" the middle. The third mechanic is called Induction Cascade which is a short cast by the boss which places a small blue/white debuff on a player, when the debuff expires the player, and anyone standing close takes a decent chunk of AoE damage in pulses, simply have the player move away from the group. This is a mechanic that continues to appear throughout the boss fight and it’s important that the person who has this debuff moves away from the group quickly to avoid dealing massive damage to the entire raid. 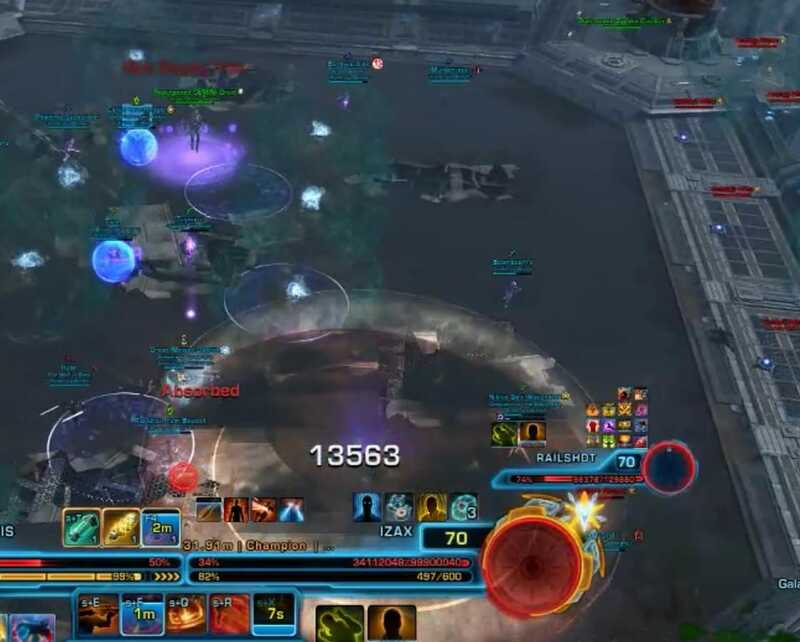 During the first phase, the boss does cleave damage as indicated by the picture above and places a stack on the active tank, face the boss away from the raid to ensure that the group is not taking the cleave damage as well as to ensure that the group can get the Dodgeclaw achievement. 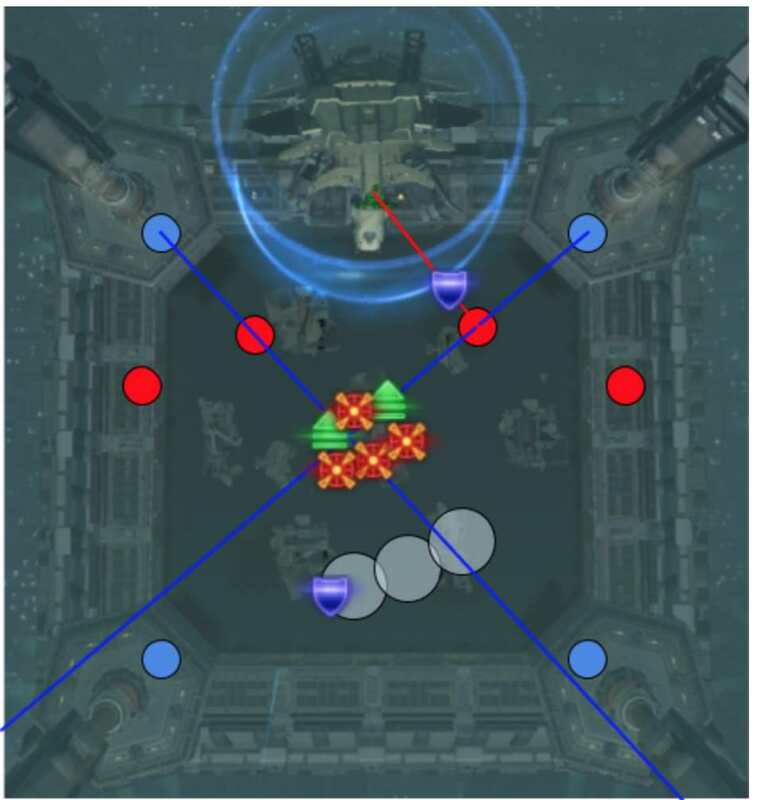 On HM, tanks will take more damage as they gain more stacks making swaps recommend, then the group moves as indicated by the arrows depending on which side the boss is facing. For SM, stacks don't affect tank that much meaning no swaps are required and the group can be positioned on the far left side while the tank is on the far right. When the phase swaps, the group will get knocked back a significant distance, on both sides of the room there are large pylons which the group gets “bounced” back on, or you can stand towards the middle of the room you will survive the phase swap. The next phase starts right after the knockback, a large white circle will spawn somewhere and an Anchor Drone will spawn in the middle of it, this Drone prevents anyone from moving outside of its circle and needs to simply be killed quickly. The boss is immune to damage, has a shield and lots of adds are spawning around the room, to quickly deal with this mechanic have one person, either a Tank or a DPS (DwT is easier) take aggro of an Amplifier Droid and an Energy Droid, preferably on the close left or close right side of the boss. The Energy Droid fires a blue beam (indicated by the arrows above) which, if aimed at an Amplifier Droid, will amplify the strength of the following beam from the Amplifier Droid (indicated by the red arrows above). If this red beam is fired straight towards the boss shield, the shield will break and you are able to DPS him and then the phase will repeat until the boss his 79%. The mechanic here is that the Energy Droid fires a beam, it provides a stack on the Amplifier Droid which boosts the strength of the beam from the Amplifier Droid, for SM you only need one stack to break the shield, meaning you only have to aim the blue beam to the Amplifier Droid once. However for HM you need 3-4 stacks, meaning you need to utilize as many of the Energy Droids as possible, normally DPS takes aggro of the Energy Droids in the back of the room (assuming boss position considered front) and provides the extra stacks to the Amplifier Droid. 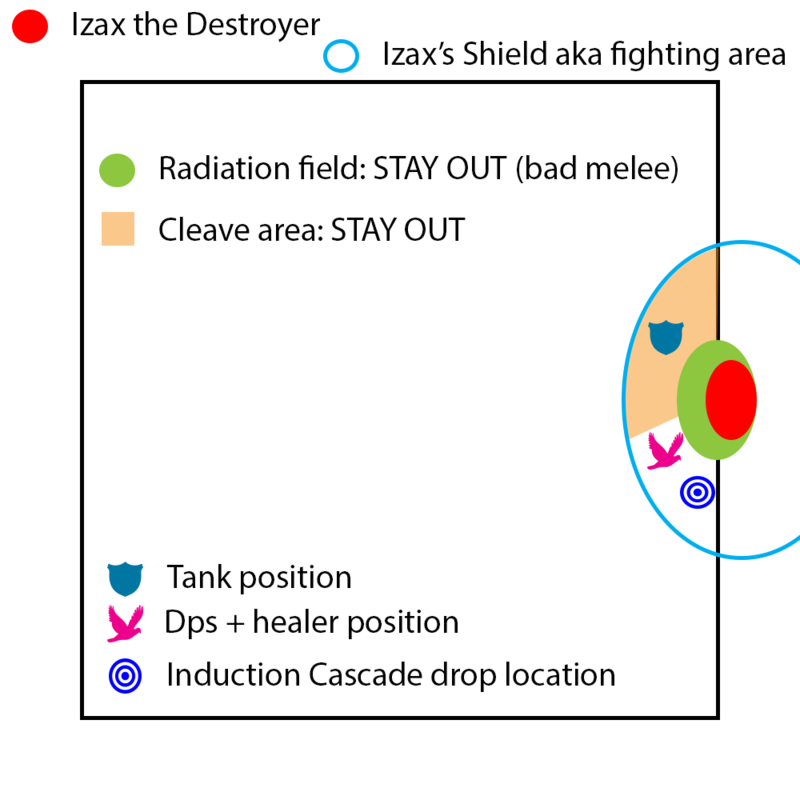 For tanks, it's important to maintain aggro on the boss throughout this phase, as well as the following phases, this is due to the circle mechanic indicated in the picture below, the boss will periodically place a circle on the active tank, making him and anyone who stands in that circle take a significant amount of damage. 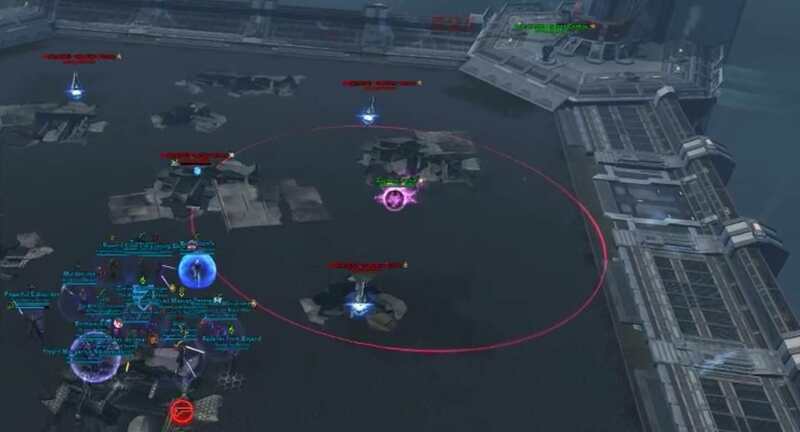 What I found to be a good approach to dealing with this was to simply have one tank kite these circles on the edges of the room while the other tank either dealt with the Amplifier Droid and Energy Droid or dealt with the adds that spawned in front of the shield. 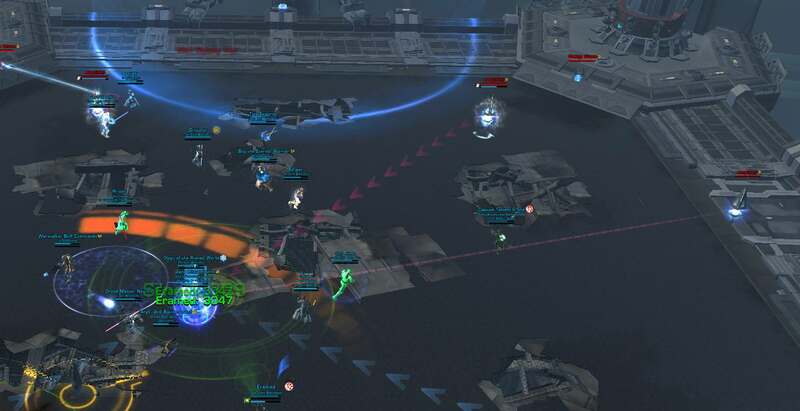 An Electro-Tether Droid spawns close to each white circle with an Anchor Drone, this drone stuns its target but it can either be broken or the droid can be interrupted/stunned and simply DPS: ed down. As it dies, it will drop a minor white circle/icon at its place which, if ran into provides the player with a temporary ability bar with two abilities. One ability is a grapple, the other simply passes the ability-kit to another player, these will be used in later phases to deal with mechanics. Having them on DPS or Tanks is recommended, heals are generally busy healing later on. As the boss hit 79% the next phase starts, the boss drops down at a side of the room and starts off by doing ~70% of everyone HP in damage, this mechanic is likely HP removal, meaning defensive cooldowns does not reduce the damage taken. Simply ensure people are healed up before and group right in front of the boss as you have your healers get the raid back up on health. Two Electro-Tether Droid will spawn around the middle of the room, stunning one person each, simply kill this by either pulling them towards the group using an Assassin Tank or Powertech or having rDPS kill them. These drops another Grapple kit each which DPS can pick up. During this part of this fight, you will become bored and lose focus, however, apart from mindlessly DPS: ing, there are two mechanics to keep in mind. First, the boss casts “Charge Omnicannon”, a 2-second cast that if finished will add two stacks to the boss, if the boss hits 100 stacks your group will wipe, to prevent this simply interrupt the cast. If the boss reaches 80+ stacks, I would advise clicking the button on the pylon to the left of the boss, this makes the boss disappear briefly and resets his stacks. Induction Cascade is the second mechanic during this phase, just like during the first it puts a debuff on a player, as it expires the player and everyone close takes a decent chunk of damage, simply move out of the group if you get this debuff. After what will feel like five years, when the boss hits 59% the next phase starts and here is the only (?) part where you really need two tanks. 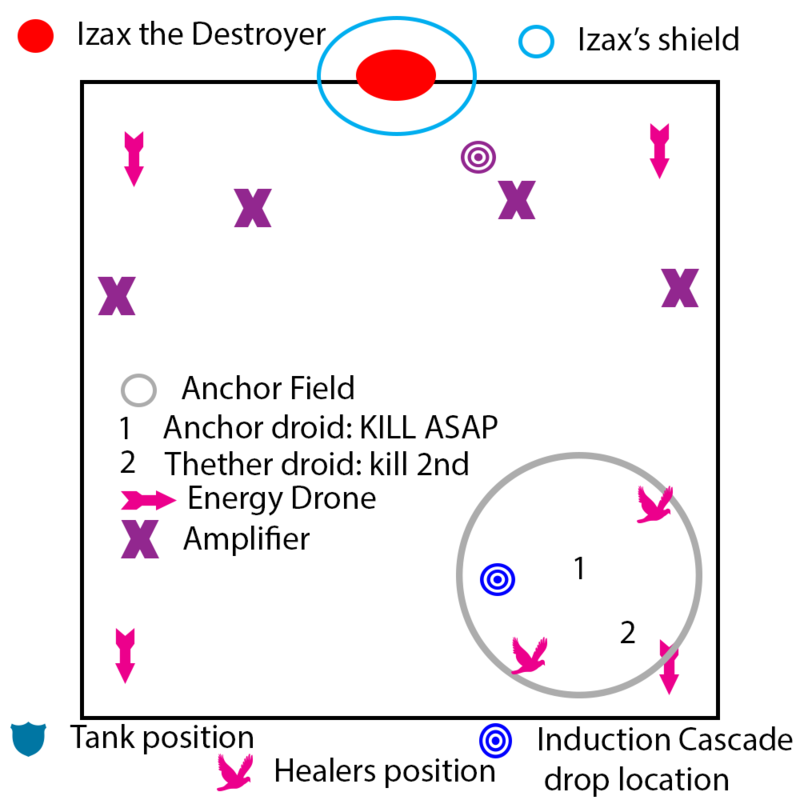 There will be five droids spawning in the middle of the room, along with a friendly Augment Droid, one tank deals with the five droids in the middle and the rest of the group stack up in front of Izax new position and DPS him down. The tank who is tanking Izax need to be aware that there will be puddles of lightning places at that person's feet, so what I found to work the best was to simply tank it while standing away from the group and placing the circles a 20-30m distance from the raid on either the right or the left side. The distance is important since the tank needs to continue taunting to keep aggro of the boss, if the tank loses aggro the DPS will get the circles on them which is likely to kill anyone with slow reaction speed. The five droids in the middle of the room is used in a similar manner as the Energy Droid and Amplifer Droid in Phase 2, using the beams the tank who does this mechanic will be able to either charge the Augment Droid with power which increases the damage dealt by the group, or the tank can target the boss with the charged beam, making the boss take increased damage. The Augment Droid however, the friendly purple colored orb boosts everyone's DPS and HPS when charged by the tank doing the droids in the middle. A person who has the Grapple kit can use the first ability to “pull” the orb closer to where the boss is, this is done by targeting the Orb and using the first ability which pulls it closer to the person who is using the ability. Do it a few times so it gets close to the group and then it will boost everyone's DPS/HPS, however be aware that when the Orb gets charged up and starts looking Pink/Purple, it will deal damage to anyone that stands very close to it, so just ensure the outer circle covers the group and you are fine, no need to have the orb be right ontop of the group. As the boss gets closer to 30%, the “Fake Master & Blaster” mechanic starts, this is simply loads of orange circles around the room with one small area which can be either in the middle or really at any of the edges of the room which is not covered by a circle, run there quickly. There are no droids, boss or another form of damage going on in this phase so everyone focuses on getting to those places quickly as the circle's shifts. Welcome to the 2 minute survival phase, a Scyva-copy spawns in the middle of the room, this is friendly and just like the orb in the earlier phase can be “grappled” to move it around the room, try to move it out of circles, away from mines and away from the blue/green orbs that pass through the room. If a Tether droid is not dealt with correctly by the DPS, it will start its case on Scyva and prevent her from being moved around, simply interrupt/stun/kill the Tether to abort this. What is generally recommended as a tactic is that Tanks deals with the mine using the tether and "grapples" them over the edge of the platform using the first temporary ability, additionally important is to continue having aggro of the boss as he continues to place circles at your feet. Healers generally have quite an easy time, I would advise that one healer is in charge of grappling Scyva out of the circles and away from the blue orbs while the other healer is in charge of keeping the group up. Overall the damage taken by the raid during this phase is very low (unless people screw up mechanics) and one healer is plenty enough. 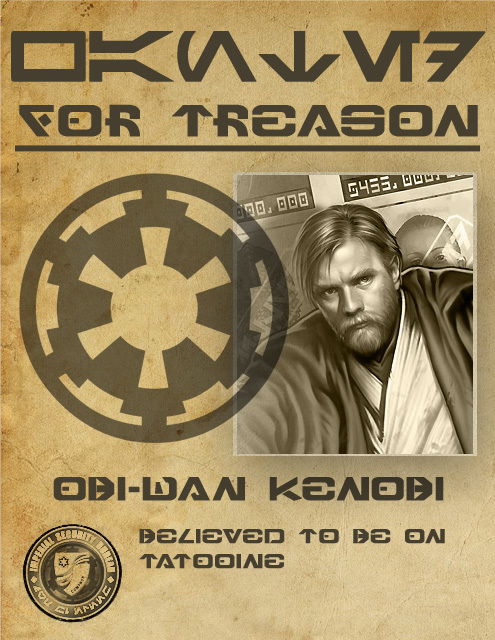 For the DPS, they are assigned to interrupting and killing the Tether Droids that spawns in the four corners of the room, doing this as quickly as possible allows Scyva to be moved around and reduces the damage she takes (she will take damage from everything, orange circles, blue orbs, mines and tethers, if she dies you wipe). During this phase, the boss also spawns blue/green orbs at one side of the room that pass through the room in “lines” towards the other side, these lines have gaps however where you need to move as you take damage if you run through an orb or it runs through you. When the 2 minutes are finished and if Scyva is still alive, Izax will do a large explosion, indicated by a massive orange circle that covers the majority of the room. However, there will be areas on the opposite side of the boss which are not covered by the orange circle, simply move to these areas, what is generally considered safest is the far corners where you will be protected by the Overloaded Bypass Conduit which is located on each corner of the room. Simply stand ontop of this droid and you won't take the massive damage which you would if not protected. If there is interest I will add a short guide to how to clear the trash prior to the boss here, but to make a long story short, use the Deflection Droids to extend the purple beam until to reaches the Beam Node thingies. On SM you can use multiple on the second one which is the more annoying of the two puzzles, remember that the Deflection Droid will transmit their beam towards its target, meaning you need to be standing behind the "next" droid to if you have aggro of the prior one. The HM achievement for doing the second puzzle with only three droids is quite difficult but I can add to that as more of the group's groups gets to the boss or if we organize an event to get people that achievement. Things to note: Combat Revive has a 30-second cooldown, abuse this to instantly revive anyone who dies during the boss fight, having everyone up helps a lot with pushing phases quicker. Nice. Is it work in HM too or only in SM? What about towers on the corners, on both sides of Izax? Don't you have to damage them? Or is it something from HM version? Added phase 2 and changed phase 1 picture to coincide with the minimap oriëntation. Am away on a skiing trip until Monday so will be a bit slow on responding and updating for a while, but thanks Derp for the cool maps! Apart from if you miss like 40 interrupts, you can totally avoid interacting with the turrets. Kill video of Izax HM can be found over here.